Sure to turn heads, the COOLPIX S9400 sacrifices nothing for a sleek, stylish design. Packed inside its pocket-sized body is a powerful 18x zoom super-telephoto NIKKOR glass lens with lens-shift Vibration Reduction and Motion Detection. Both of these features are designed to help you take astonishing close-ups that are razor-sharp, even if your hands are a bit unsteady or your subject is moving fast. Its large 3.0-inch 614,000-dot OLED display features Clear Color Display technology and an anti-glare coating for easy viewing, even in direct sunlight. And with an 18.1-megapixel low-light CMOS image sensor, you can shoot without a flash in most low-light situations and enlarge your favorite shots to poster size! Wherever you go, slip the COOLPIX S9400 into your pocket and collect striking memories. Imagine being able to shoot without a flash at weddings, concerts, parties—anywhere your flash normally fires. You won't have to interrupt a moment to capture it, and your photos and HD videos will look more natural and true to your memory. The COOLPIX S9400 performs so well in low light situations that, in most cases, using the flash is optional. Of course, when the lighting is extremely poor and you need a flash, it'll be there. Create truly exceptional photos and HD videos with the COOLPIX S9400. Its high-performance NIKKOR glass lens is paired with a 18.1-megapixel CMOS low-light image sensor for superior image quality, versatility and low-light performance. Your shots will impress even you. 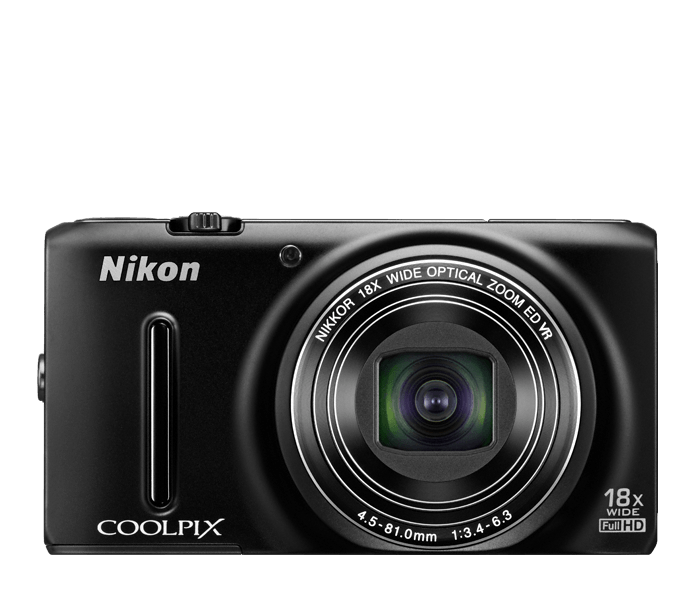 If you want a compact camera that shoots stunning Full HD videos, the COOLPIX S9400 delivers. 1080p Full HD means exceptional video quality. Record the action, then connect to an HDTV and watch your videos come alive. A built-in mic records high-quality audio in stereo. Your videos will look and sound phenomenal. The COOLPIX S9400's large, high-resolution OLED display makes it easy to compose your shots or monitor your video recording. Reviewing and sharing your creations is a pleasure, too—every shot looks fantastic on the display. When your subject is moving fast, Motion Detection automatically kicks in and selects a faster shutter speed and higher ISO (light sensitivity) to help you get sharper, clearer photos. Easily apply fun and creative Image Effects like Selective Color, Miniature, Skin Softening and more right from the camera—no need for additional photo or video-editing software. Not sure which Scene Mode to choose? No problem! Select Scene Auto Selector and let the camera make the call. From Night Portrait to Backlighting, the COOLPIX S9400 will use the most optimal Scene Mode for your situation. Based on Camera and Imaging Products Association (CIPA) standards for measuring the life of camera batteries. Measured at 23(-/+2)°C (73(-/+4)°F); zoom adjusted with each shot, flash fired with every other shot, image quality set to Normal, image size set to 4896x 3672 (18.1MP). Battery life may vary depending on shooting interval and length of time menus and images are displayed.